If you want to consult or engage more deeply with a local community, or range of interests, there's no shortage of methods recommended for use by facilitators and their clients. 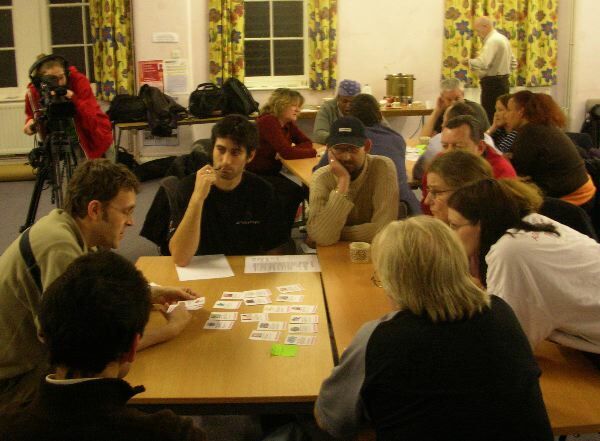 You may think about focus groups, workshops or roadshows backed up by newsletters and other documents. Fairs can offer fun, citizens' juries foster deliberation. Then there's all the more recent web-based processes. We recently ran another session of our Digital Challenge workshop game, used to help plan area-wide technology programmes. Last time it was Bristol - this time we were at the Manchester Digital Development Agency, which is one of the most experienced outfits in this field. Could our simple set of project cards, used to prompt discussion about how technology might benefit local people, bring anything to the techie toolkit? Beth Kanter and I had a couple of great workshop sessions at the UK Circuit riders conference yesterday, talking about social media and nonprofits - and I think the participants enjoyed it too. We tried to make it as interactive as possible. Beth live-blogged the opening session. For our workshops, Beth had slimmed down her 81-slide Powerpoint presentation (it is a real work of art) to a "Wikitation", which is slides on the wiki organised so it is easy to jump to examples. That way Beth was able to run through the main social media tools and explore how people were trying these in practice. You can see both see both here. Last night I witnessed an impressive example of the power of collective intelligence at work on how social media and other technologies can change people's lives and benefit local communities. The setting was not a high-tech lab or forum of Web 2.0 developers ... it was a community centre in Bristol, and the experts combining their wisdom were local residents. We got together to help the city council develop its bid to win the Digital Challenge, a competition among ten finalists to show the UK Government how well they are improving online services and ensuring all citizens benefit from the Net. As part of the bid - due in January - the finalists have to include storyboards showing how the wireless networks, access centres, e-learning, e-democracy, e-commerce ... e-whatever projects will be used by different people in their area. 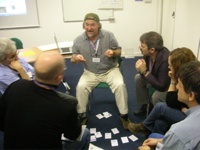 We are currently developing a workshop game that will help people play through the ways in which technology projects can deliver better public services, and also promote social inclusion. The first game users will be partnerships involved in the Digital Challenge, under which the UK Government and industry is offering about £8 million to local councils and their partners. More here about the game and the Challenge.